1 of 4 Heat oven to 350 degrees F. Line an 8-inch-square baking pan with nonstick aluminum foil. 2 of 4 Combine 1 cup of the chocolate chips (half the bag) and butter in a medium-size microwave-safe bowl. Microwave on high for 1 minute. Stir until smooth. Whisk in sugar, then eggs. Stir in flour and salt until smooth. Fold in 1/2 cup of the chopped walnuts and the vanilla. Transfer batter to prepared pan. 3 of 4 Bake brownie 350 degree oven for 23 to 25 minutes. Finely chop remaining 2 tablespoons walnuts. 4 of 4 Sprinkle remaining 1 cup chocolate chips over brownie and return to oven for 2 minutes. Remove from oven, and spread melted chips until smooth, to form a frosting. Top with finely chopped walnuts. 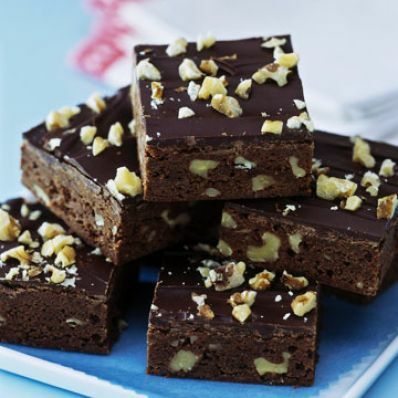 Refrigerate 20 minutes to firm chocolate, then cut into squares. Store at room temperature. Makes 16 brownies.